'London Midland Electrification', BR (LMR), 1961. Poster produced for British Railways (BR) London Midland Region (LMR), introducing electric trains on the line between Liverpool and Crewe. The poster shows an electrically- hauled expres train pasing a local electric train. The poster details how the opening of this service completed the second stage of an extensive scheme, which had seen the introduction of electric trains between Manchester and Crewe the previous year. Artwork by Greene. 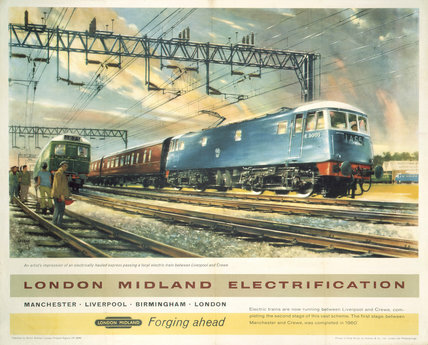 'London Midland Electrification', BR poster, 1963. 'The Paris Night Ferry', BR poster, 1957.